he Radio City Rockettes originated more than 90 years ago, and we are so proud to carry on the sisterhood and legacy of the many amazing women who came before us. With all of that rich history comes many interesting facts that you may not know about the precision dance company that has been performing on the Great Stage since 1932. Here’s a look at some lesser-known tidbits about us—some may surprise you! 1. 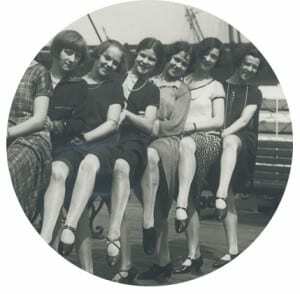 The Rockettes were inspired by John Tiller’s “Tiller Girls.” The Rockettes began kicking up their shoes since Russell Markert, the Rockettes’ chief choreographer, image-preserver and resident “father figure” of the famous troupe until he retired in 1971, founded the exemplary American chorus line—an exciting precision dance company with great style, flair and glamour—in 1925. Inspired by the British dance troupe formed by John Tiller (“The Tiller Girls” performed in a 1922 Ziegfeld Follies production), Russell wanted to achieve absolute precision and ultimate uniformity in the movements of the dancers. 2. We weren’t always called the “Rockettes.” The dancers known as the “Missouri Rockets” made their show debut in St. Louis. That same year, the troupe traveled to New York City to perform in the Broadway show Rain or Shine, and were discovered by showman S.L. “Roxy” Rothafel. The “Missouri Rockets” were such an instant hit that Rothafel was loath to let them leave after their performances at the Roxy Theatre. Rothafel pleaded with Markert to form another line to replace the departing “Missouri Rockets.” While there were three separate dance troupes performing in New York City at that time, Rothafel moved two of the troupes to Radio City Music Hall for its opening night on Dec. 27th, 1932 where they performed a routine to the song “With a Feather in Your Cap.” He dubbed the chorus line the “Roxyettes.” Two years later, the “Roxyettes” officially became the Radio City Music Hall Rockettes. 3. Over 3,000 women have performed as Rockettes. Since the Christmas Spectacular’s opening night in 1933, more than 3,000 women have shared in the legacy by performing as a Rockette. It’s the ultimate sisterhood! 4. There’s a morning and afternoon cast in the Christmas Spectacular. There are a total of 80 Rockettes—40 Rockettes in each cast, and only 36 of us perform onstage at a time. Each cast has four “swings” who can fill in the spots for nine of the women on the line. 5. We Rockettes need to be a certain height. Each of us has to be between 5’6″ and 5’10½” and must demonstrate proficiency in tap, jazz, and ballet. 6. Your eyes are deceiving you! The illusion of our uniform heights has always been maintained by having the taller dancers in the center of the line and placing dancers of gradually decreasing height on either side, with the less tall women at both ends of the line. 7. We do our own hair and makeup for performances. We wear a signature red lip (either MAC Red or MAC Russian Red—both are blue-based tones that pop under the bright lights! ), false eyelashes and a French twist. 8. Our shoes are mic’d up. Ever wonder how the entire audience can hear each step of our tap routines? Wardrobe removes the heel and sole of our LaDuca tap shoes, and inserts a custom leather sole that attaches to the bottom of the shoe. A new heel is made that allows a special cavity within the heel for the sound transmitter to be stored inside—this helps pick up the sounds of our taps (14,096 AA batteries are used throughout the run of the Christmas Spectacular!). 9. We can kick up to 650 times in one day. We do more than 160 kicks per show and perform in up to four shows a day during busy periods! 10. We’re pros when it comes to changing costumes. The quickest change in the Christmas Spectacular occurs between the “Parade of the Wooden Soldiers” and “New York at Christmas” numbers, where we have 78 seconds to change in the wings of the Great Stage—with the help of our dressers, of course!